Hi Salix, So sorry to hear about the family situation, but glad to hear you are feeling better. Healing can be such a roller coaster, especially when family issues get in the way! 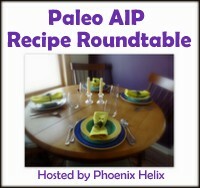 I did a post a little while ago on eating AIP on a budget (http://wp.me/p5yQOe-1M). Maybe some of the tips might help you? As a fellow Calgarian, I know how expensive this city can be to live in! Thankyou for your kind comment. I will certainly check out your post. I am so glad that you liked the beet Kvass. My heart goes out to you as you deal with your life changes. You have been greatly missed! Thankyou for your kind words. I probably will not be blogging every single day, but I am intending to get back into things. You were missed, hope you can take care but also prioritize your relationship and perhaps recover it, it’s not good to be alone.